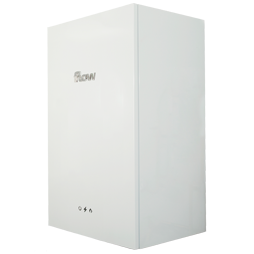 The Flow micro-CHP is a gas boiler that generates electricity – saving energy and slashing bills. Ideal for homes with 3-5 bedrooms, it can run on either mains gas or LPG. As a micro-CHP, the Flow boiler is eligible to receive the Feed-in Tariff, making it an attractive option financially. Homeowners can also opt for a package from Flow, which includes both the boiler and energy supply, where the boiler pays for itself in just 5 years. Not only does it save on your energy bills, the Flow boiler also reduces household carbon emissions by around 20%. The Flow boiler is an electricity-generating (micro-CHP) condensing gas boiler requiring a separate hot water tank. It looks just like a standard boiler and it can be easily hung on the wall. The similarities don’t stop there – it uses very similar components to most other boiler manufacturers, making it familiar and easy to install for any experienced heating engineer. If you’re interested in installing Flow boilers, the company is continuously running training courses for installers. From here you can gain full accreditation and become a Flow Brand Ambassador. Interested in learning more about the Flow boiler?